The SparkFun micro:climate kit is a full weather station kit that is built on top of the weather:bit carrier board. 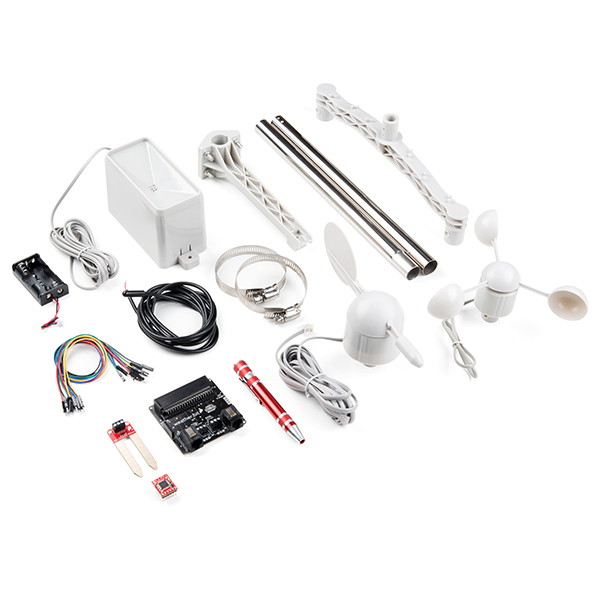 Unlike previous weather kits we've carried, the micro:climate kit includes our tried-and-true Weather Meters and Soil Moisture Sensor, so whether you’re an agriculturalist, a professional meteorologist or a hobbyist, you will be able to build a high-grade weather station powered by the micro:bit. You can even talk via wireless communication between two micro:bits with this kit to be able to monitor the weather without being exposed to it! Inside each micro:climate kit you will find all the components required to build your micro:bit into a go-to weather sensor; the only parts not included are two AA batteries and the micro:bit itself. Simply add your own micro:bit to the provided weather:bit, assemble the kit, and you will be ready to start sensing. The SparkFun micro:climate kit is a great way to get your feet wet in high-grade sensors --- just not literally; that's the weather:bit's job! Note: The SparkFun micro:climate kit does NOT include a micro:bit board. The micro:bit board will need to be purchased separately. When the board was first released, there was an issue with the [pxt-weather-bit package](https://github.com/sparkfun/pxt-weather-bit) and it has since been resolved in the latest version. If you still have issues with the micro:bit reading the BME280 values, try * re-adding the `Weatherbit` package * replacing the weatherbit's code blocks in MakeCode If you are using example code from the micro:climate kit, it has been updated to reflect the latest packaged version. When the board was first released, there was an issue with the pxt-weather-bit package and it has since been resolved in the latest version. If you are using example code from the micro:climate kit, it has been updated to reflect the latest packaged version. I'd like to use the data logger to log wind speed/direction data. But, as I understand it, the micro.bit only holds one program at a time. If I load the wind speed/direction program it overwrites the data logger program. Would combining the two programs into one work?